Right now, what we need is a flower power photography workshop to shake off the winter blues. It's been a prolonged, cold, dull winter here on Vancouver Island. So dust off your camera and let's get out in the garden. Hmm, your photography skills aren't what you'd like them to be? We need an afternoon in the garden to help out with that... and celebrate a much welcome spring, No better place than in a magnificent garden and woodland environment here on Vancouver Island for flower photography. Right beside the ocean! A dainty White Fawn Lily, Vancouver Island. Painterly textures. 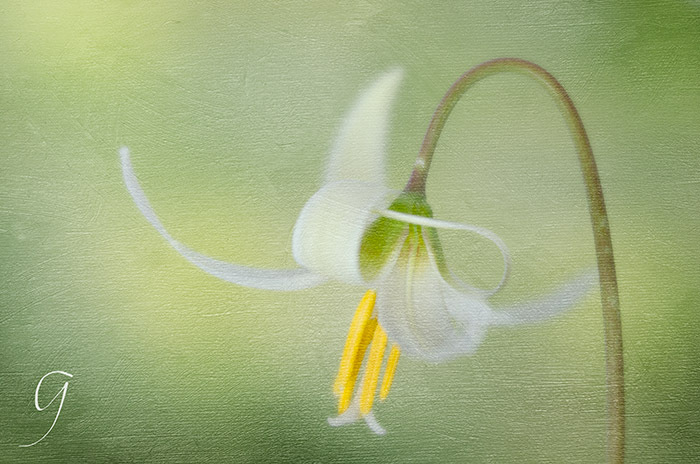 A soft macro photograph with limited focus of a wild and delicate White Fawn Lily. LEARN HOW TO properly expose your subject and choose the focus you want for your image when you attend this workshop. 12:45 - Meet Glenys (your instructor) and your fellow photographers. 1:00 PM - Start out in the classroom (the Magnolia Room) for some basic photography. Make sure to bring your camera along. A cell phone camera, a point and shoot or a DSLR... they're all good. 2:30 PM - Let's take a break. If you'd like tea and a scone or dessert, we've booked the dining room for a 20-30 minute break. I'm sure there will be some lively discussions over tea! The Tea Room Menu - please not that the cost for refreshments is not covered by your workshop registration fee. You are welcome to bring your own refreshments - you can stay in the Magnolia Room if you do so. 3:00 PM - Weather permitting, we'll move outside, into the gardens to put all you learned into practice. 4:00 PM - Wrap up, but no worries. I look forward to your emails or calls and I'll be happy to answer any questions that come up with your photography. Learning photography is painless and you’ll be flabbergasted with the photos you’re capable of creating. It’s a little box with a hole - nothing to be afraid of. In fact, it’s a lot like your gorgeous eyes. We’ll start by checking out the EXPOSURE TRIANGLE. Once ‘exposure’ clicks, we’ll focus on PHOTO COMPOSITION to give your pictures some chutzpah. Confess! Your camera’s been doing all your thinking for you. 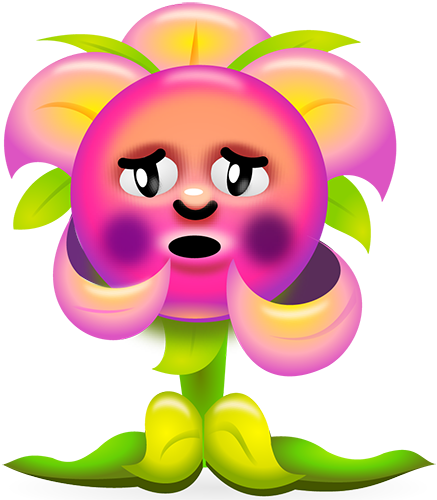 Poor thing’s been stuck in Auto. Never stretched its legs to show you what’s under the hood. Today, that changes. We'll flip the switch, check out Digital Camera Modes and get back creative control. (Ever been cornered by Aunt Mildred... forced to look at her 300+ vacation photos? Ouch!) Unlike Aunt Mildred’s photos, we’ll make sure your photos get a raving reception when you share. A lovely wild daisy on the hillside in Qualicum Beach. LEARN HOW TO make one flower the centre of attention using selective focus at our workshop. Wild daisies beside Laburnum Road. And, just so you're aware.. CELL PHONE CAMERAS are more than welcome. I’ve got lots of tips, tricks and apps for them. Create amazing pictures that rival your friend’s “big girl” camera. In fact, mobile photography is an actual photography niche now. After a short break, in our last power hour of the day together, we’ll be outside making outrageously beautiful pictures. We'll try some close ups and landscapes and experiment with focusing. I'll bring out a few photo aides to play with, too... fun, fun, fun! This is the time to show off your photos to newfound friends…. Brag away, sweetheart! Deadline to register and pay is May 16, 2017 at midnight. If space is filled prior to May 16, registration will be closed at that time. There will be no entry to the workshop without prior registration. The registration fee covers your entry fee to the Milner Gardens and Woodland. Your name will be given, along with all other participants, to the staff at the main gate. There will be 3 teaching sessions during the afternoon, two indoors at the main house and one in the gardens if weather permits. If the weather doesn't oblige, the third teaching session will continue inside, after the break. Participants are invited to email or call me after the event with questions or problems with their photography. The registration fee does not cover any purchases beyond the workshop and entry fee, such as in the Tea Room for the break. Until May 11 midnight, you will receive your registration fee minus a $10 administration fee. From May 12 until May 15 midnight, you will receive a 50% refund for cancellation. After May 16 at 12:00 Noon, there will be no refunds if you cancel. The beautiful trillium was in the forest beside the Little Qualicum River. 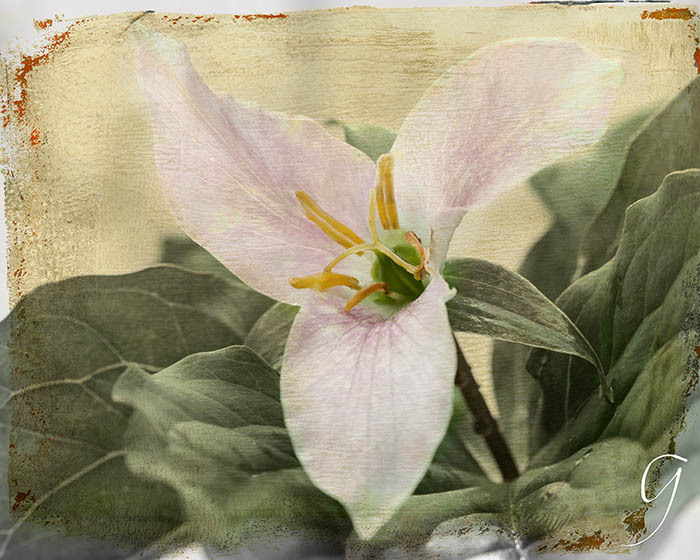 This wildflower photo is a close up of a small pink-veined trillium with a lovely framing group of leaves. LEARN WHEN TO choose a close up or macro of a flower and when to photograph a landscape at this workshop. Learning Events - So Important and So Much Fun! If you're like me, the majority of your learning is online. No one adores the internet more than I do. It's one of the greatest tools for learning addicts. I need an occasional change from online learning. Computers are super but spending too much time in that relationship gets lonely, right? Being somewhat of an introvert, going to workshops and seminars encourages me to get out and connect with others. I've never been disappointed because every time, it's been a renewing and energizing experience and I get to share what I know with others. And, I learn so much from others. My advice... treat yourself. 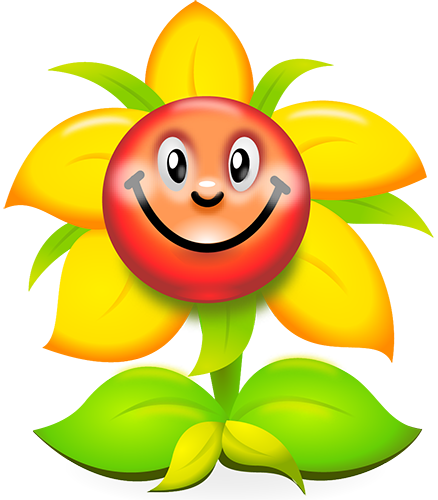 Come out to our flower power workshop. You Can't Beat a Live Event! There's just something extra special about joining a group of like-minded folks to shake up your skills. Everyone's hyped up and the energy is outright contagious. A group inspires you to take on what was mind-boggling on your own... in a group, it's easy! Making new friends with the same interest is motivating... gets the juices flowing... inspires you to get out your camera and spend the day in a garden. Maybe, even, with your new buddies. While you're learning, it's exciting to share your photos and see how much better they get over the afternoon. Bragging about your pictures isn't only acceptable, it's encouraged. At the end of the day, you'll make some more camera-loving friends, improve your photography skills... and, as a bonus, you'll feel incredibly relaxed! 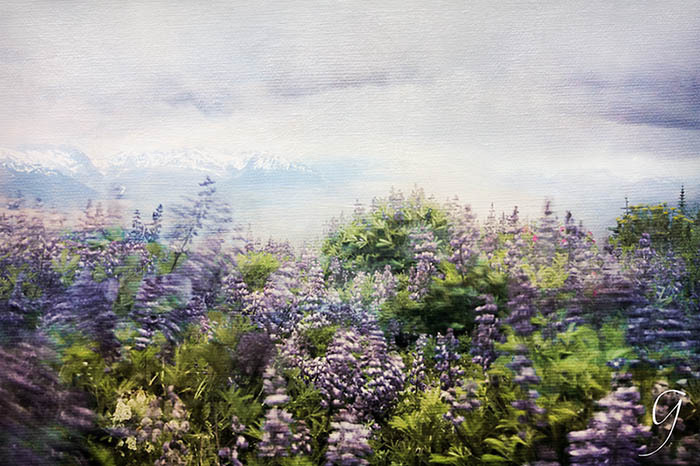 A vast landscape of wild mountain lupines. Black Tusk, British Columbia - a cold and stormy hike. Glenys Morgan loves to share her passion of photography and commitment to the natural environment. Glenys has captured images from around the world - from the Canadian prairies, where she was born, to the Middle East, Europe, Asia and Africa. She is a student of meditation and spirtuality, and brings these practices into her photographic journey. She studied Photography at Focal Point in Vancouver and currently calls Qualicum Beach home. Her classes focus on the basics of photography- whether you work with a cell phone or advanced camera. You’ll learn all about light, exposure and composition and how to make it work for you to capture those incredible moments. 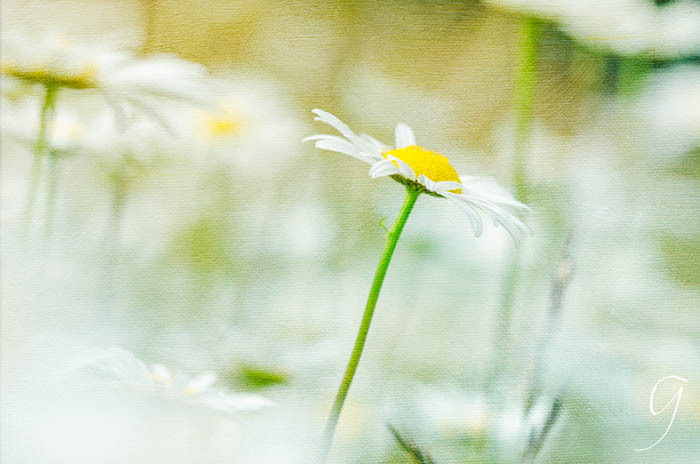 From the basics, Glenys will teach you specifically how to weave your spiritual practices into your photography to develop a deeper connection to nature through the lens of your camera. You can Connect with Glenys at her website, on Facebook, Twitter, LinkedIn, Youtube, or Pinterest!